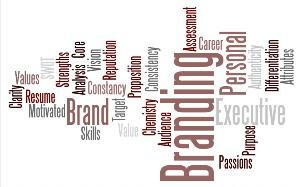 Do you think personal branding is not for you? That it’s merely a fad churned up by social media wonks, and you don’t need it to land a job? Maybe you think branding is too much about tooting your own horn, and you’ve never been comfortable with that, and you can’t stand it when other people do it. After all, you know how it works. 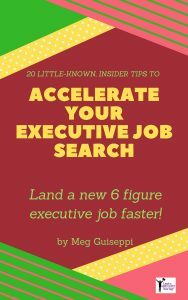 Throughout your executive career, recruiters have reached out to you when you weren’t looking for a job, and you easily moved from one job to the next. But job search doesn’t always work the way it used to. You can’t rely on things falling into place for you, without much effort on your part. You need to embrace personal branding and the newer, proven methods to stand out from those competing for the same jobs as you. 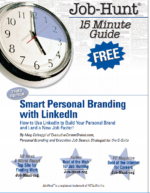 Along with knowing which companies you’re targeting, and aligning your skills and qualifications with what your target employers are looking for, you need personal branding, as a foundation for your career marketing materials (executive resume, career biography, LinkedIn profile, social media, etc.) and job search management. Branding is no longer optional. By digging deep and uncovering your unique combination of key personal attributes, passions, strengths, talents and values, branding helps you communicate your good fit BEYOND your target employers’ requisite qualifications. In today’s highly competitive c-suite job market, employers have their pick of the cream of the crop. So many others like you are likely to fit their requirements down the line. Communicating only how you offer the same, full range of expertise as everyone else doesn’t distinguish you and give you an advantage. Sameness doesn’t sell you. Differentiating the value you offer OVER your competitors is an imperative in today’s job search. Branding helps you differentiate yourself. 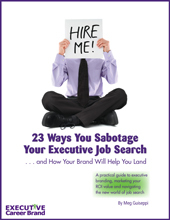 Helps you more specifically explain to your network how they can help you achieve your career goals. 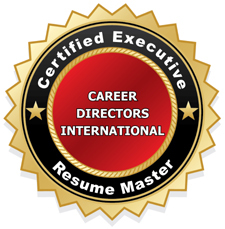 Helps you stand out above your competition in your career marketing materials (resume, biography, online profiles, etc.). 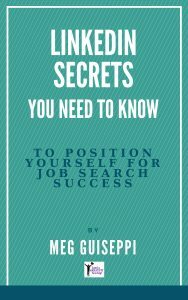 Prepares you to speak confidently and knowledgeably about your good fit qualities for your target employers. Generates chemistry for who you are, what you’re like to work with, how you make things happen, and what you have to offer that no one else does. Prepares you to network and interview better than your competitors. Helps you have the kind of conversations with employers that will lead you to a job with the right culture fit for you.